I was smiling...THANK you pain~happy pills! I didn't dress up...comfort was my main goal. Lulu the cat was the hit of the day, my Grandma wouldn't let anyone else touch her. MeMaw was very unsteady in the 1st picture posted. See the girls holding her up...well, she almost fell...nearly pulling my pants down. She was grabbing for something and my pants were it! Seriously, she was balancing herself on the wrong person. I would have fallen on top of her. My mom and Gary are almost touching in the bottom pic...shocker!! Hayden was happy about that! Layla? I'm not sure why she didn't smile.in.any.picture. Hayden tried to ride on the 'ride on' toy before it was out of the box. Why is that a shocker? I did notice MeMaw being held up and I did have to laugh a little at the fact that she chose you to hold onto. I'm glad you both are OK. Looks like a great and relaxing Christmas. I think you look very festive in your red shirt! Great pictures! Eli tried to ride on his toy before all the paper was off of the box! Then he got mad when he had to get off so that my hubby could get it out of the box! I dressed for comfort on Christmas day too! People were lucky I was out of my pjs! What great pictures Angie, so glad you are feeling better and the pain meds are working!! 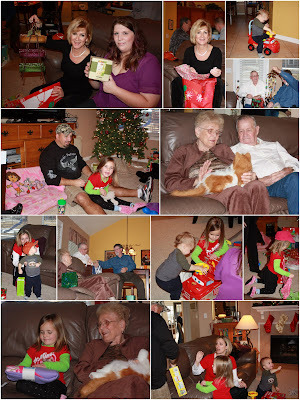 So glad you had a great Christmas!! Boxes often make the best toys! My girls spent Christmas afternoon making a fort in the front yard.with the box their easel came in. I am a confort girl too. I love that first picture and that she could have nearly taken you down. Feel better girl. LOL! Love Lulu! She does look real! Glad everyone could get together, looked like a great time! And the pictures are wonderful!